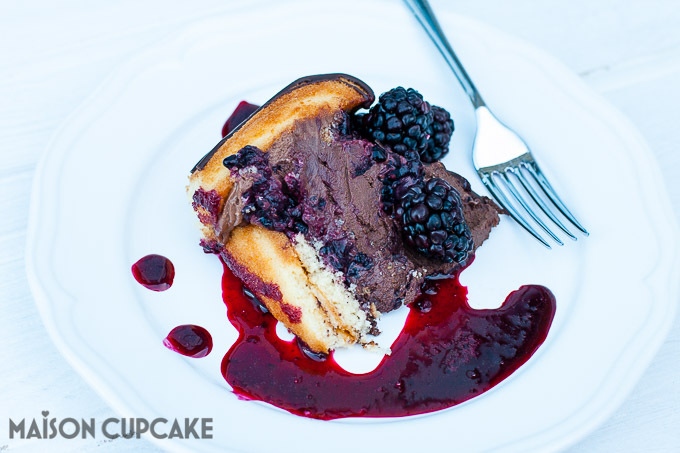 If you can melt chocolate you can make this blackberry charlotte dessert. It’s the ultimate easy showstopper chocolate cake. In association with Bonne Maman. This blackberry charlotte dessert cake may look like it came straight from a French patisserie window but I promise it’s extremely easy to make. The only piece of special equipment you need is a medium hemisphere mould* or failing that you could use a pudding basin but the hemisphere mould is the most pleasing even shape. A charlotte dessert is usually round with sponge cake on the outside and fruit inside. There’s been a flurry of interest in them since the recent birth of Princess Charlotte, daughter of the Duke and Duchess of Cambridge. The sponges around the outside are sometimes made from trifle fingers but this curvy version is using Bonne Maman madeleines*. 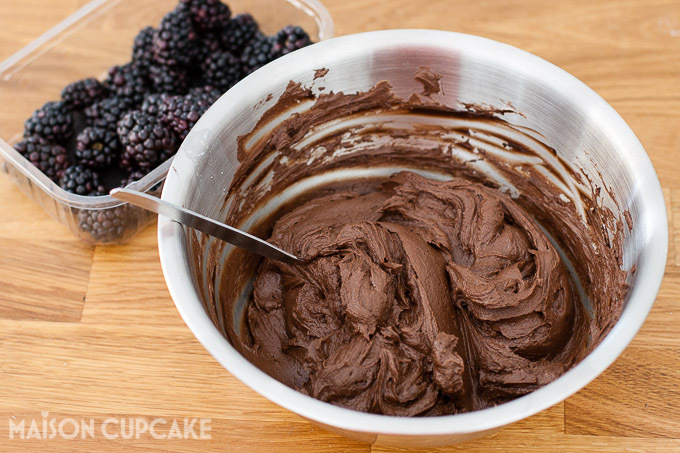 The filling is made from chocolate quark mousse to which I’ve added some blackberries. 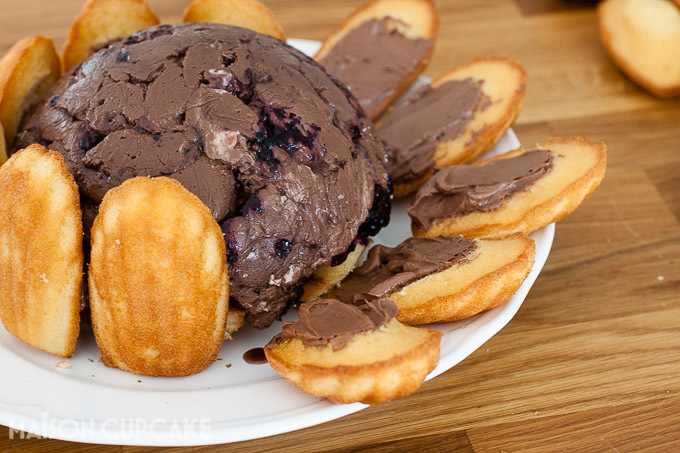 The mousse is simply quark mixed with dark chocolate at fifty fifty ratio. 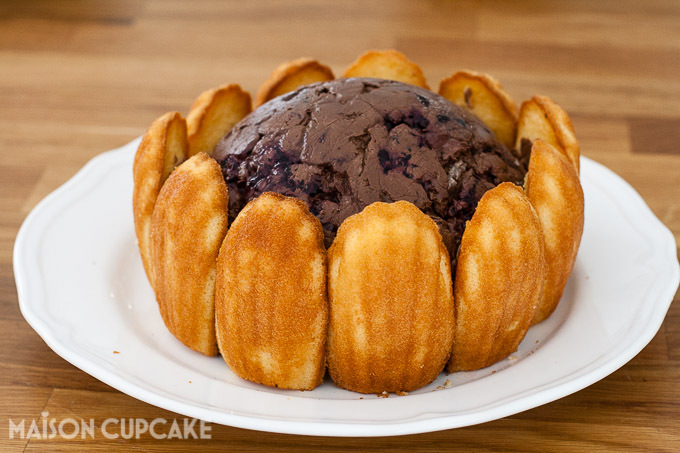 Made without eggs it stops this chocolate charlotte dessert from becoming too rich. Squash in a dozen or so blackberries. 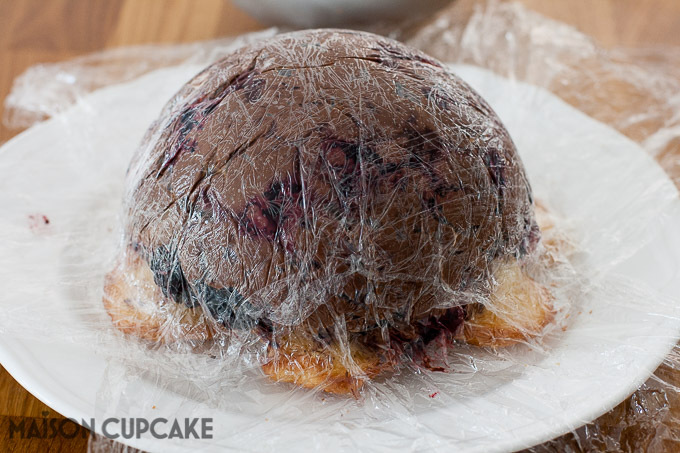 Line the hemisphere mould with a double layer of cling film and squash down a few more blackberries on the top. You can find hemisphere moulds like this one by Fat Daddios which is stocked by Lakeland and also sold by Lakeland as a trader on Amazon in various sizes. This one was a medium hemisphere mould* holding just under 1 litre volume. Unwrap six individual Bonne Maman madeleines and flatten these on top. This will become the base of the blackberry charlotte dessert. Chill for a few hours in the fridge, ideally overnight. Invert the hemisphere mould onto a pretty dinner plate. Peel off the cling film. You might want to trim any big bits of madeleine sticking out. Open 10-11 more of the individually wrapped Bonne Maman madeleines. Slice off their “bumps” – feed these to any impatient onlookers or box them up for a snack later. 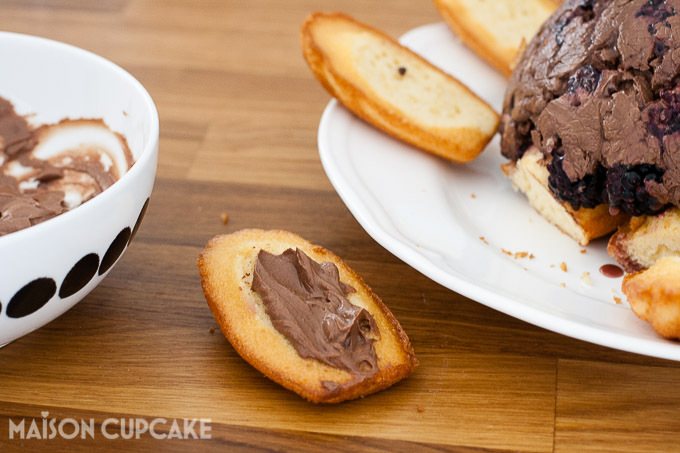 Mix up a further smaller quantity of the chocolate quark mousse and use this as a spread to affix the madeleines, cut side inwards, onto the outside of the spherical chocolate centre. 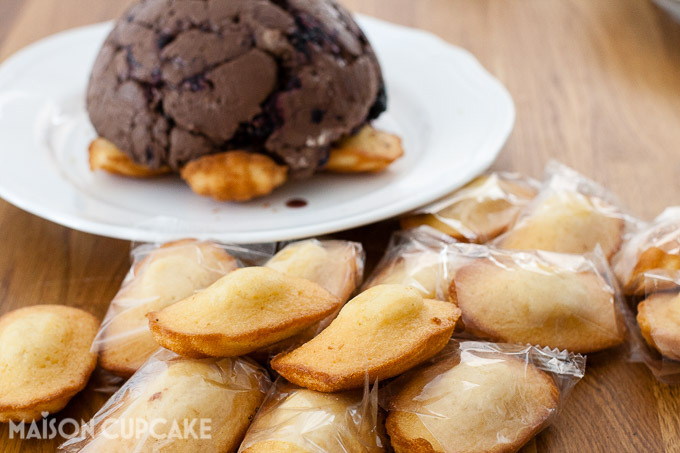 Arrange the trimmed madeleines around the spherical chocolate centre. Draw the madeleines up and press them into place so they fit around the spherical chocolate centre snugly. 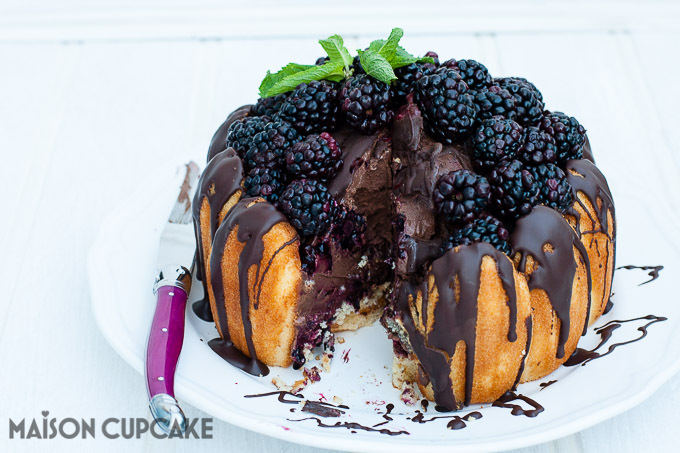 Cover the spherical centre with fresh blackberries. To tart this chocolate charlotte dessert up dress with a sprig of fresh mint and drizzle the madeleines (and the bare spherical centre) with more molten dark chocolate. 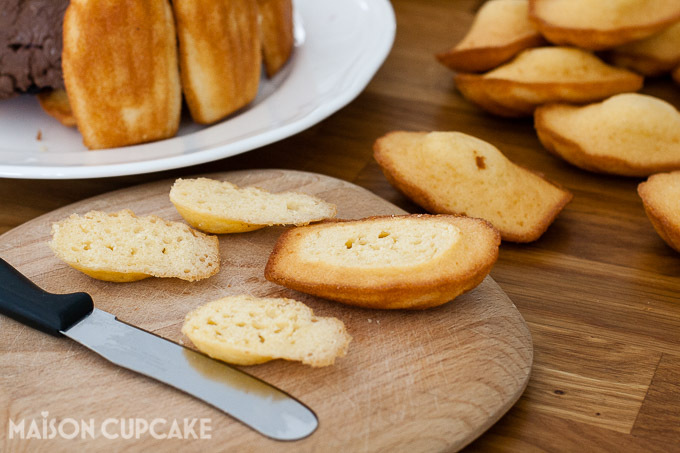 Serve cut into slices – madeleines make a great guide for the width of each slice. As an added extra I drizzled over some homemade blackberry coulis which soaks into the madeleines nicely. Even if it looks like something out of The Killing. Have you ever tried making a charlotte dessert? Melt 300g of the dark chocolate (I used short bursts in the microwave on medium power) and fold into 400g of the quark. (Don't forget to retain 50g of the quark for affixing madeleines later). 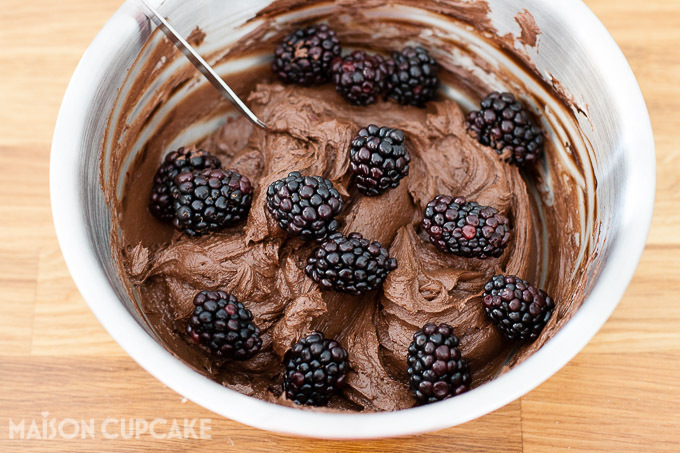 When the quark is mixed in evenly, fold in a dozen blackberries. 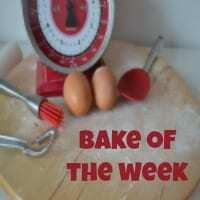 Line the hemisphere mould with a double layer of cling film and squash down another dozen more blackberries on the top. 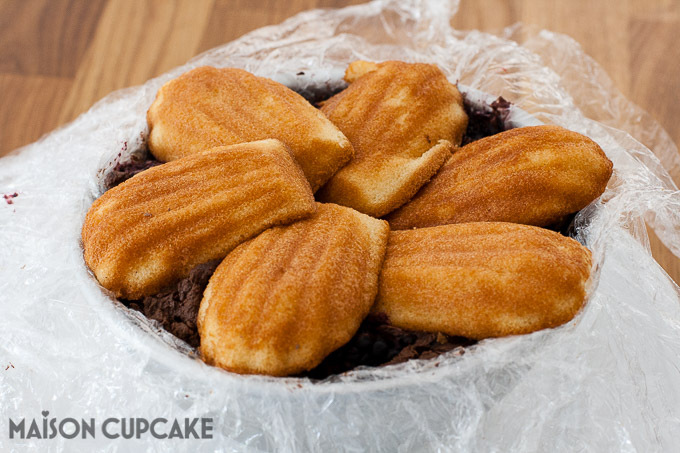 Unwrap six individual Bonne Maman madeleines and flatten these on top of the quark mousse. Draw over the clingfilm and chill the hemisphere mould contents for a few hours in the fridge, ideally overnight. 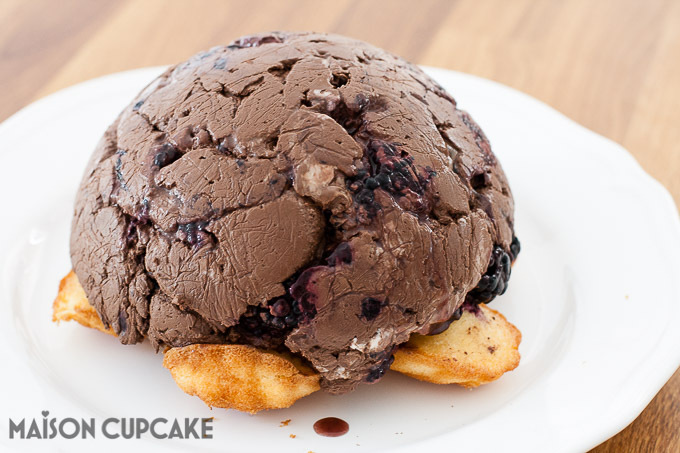 When the chocolate quark mousse is chilled, invert the hemisphere mould onto a pretty dinner plate. Peel off the cling film. Trim any big bits of madeleine sticking out. Open 10-11 more of the individually wrapped Bonne Maman madeleines, slice off their “bumps” – feed these to any impatient onlookers or box them up for a snack later. Mix up a further smaller quantity of the chocolate quark mousse with 50g chocolate and 50g quark. Use this as a spread to affix the madeleines, cut side inwards, onto the outside of the spherical chocolate centre. Arrange the trimmed madeleines around the spherical chocolate centre. Draw the madeleines up and press them into place so they fit around the spherical chocolate centre snugly. Finally melt another 100g of dark chocolate and drizzle this over the spherical mousse centre and over the madeleines in a freeform fashion. Cover the spherical centre with fresh blackberries. To present, dress with a sprig of fresh mint. Serve cut into slices with cream or blackberry coulis. Total prep time is around 60 minutes plus chilling time. 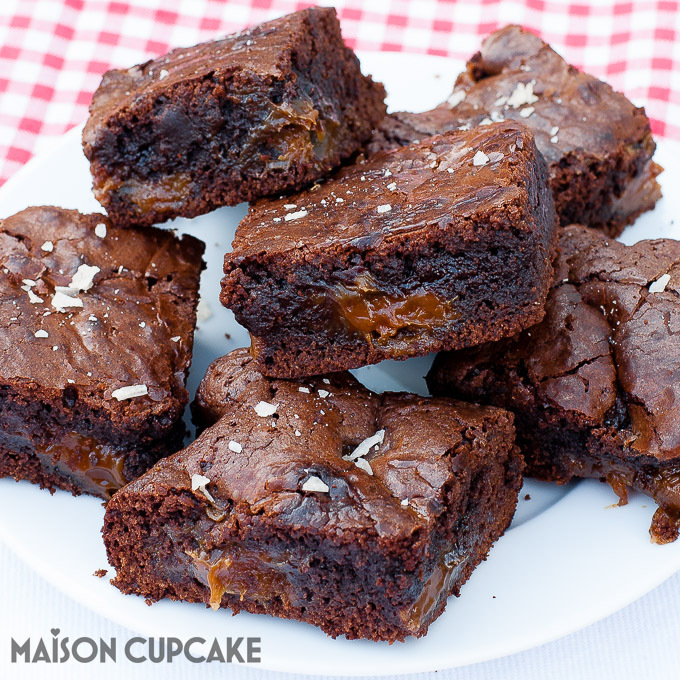 Lastly if you’re looking for an easy impressive dessert, try these dulce de leche brownies. Are you on Pinterest? Why not follow me there? Visit Sarah | Maison Cupcake’s profile on Pinterest. *Affiliate links used. 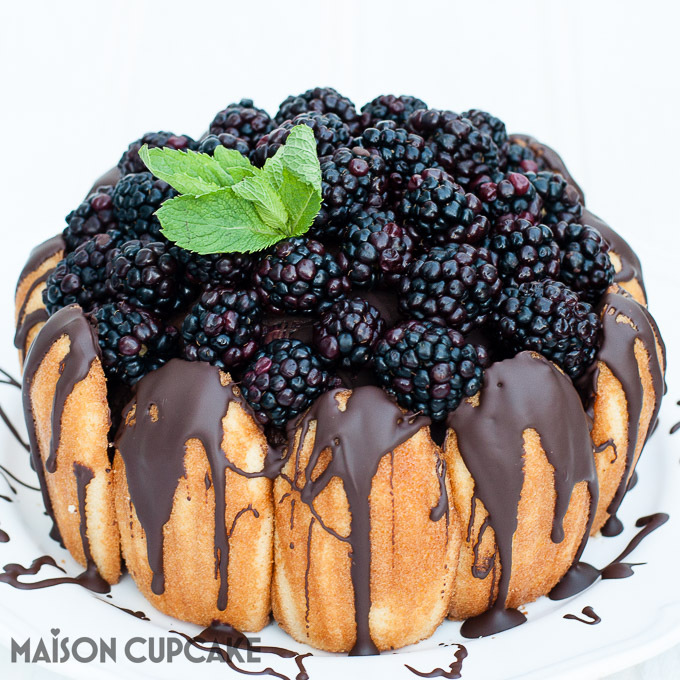 This post was sponsored by Bonne Maman but the chocolate blackberry charlotte dessert cake recipe and all words are my own. It looks oh soooo good! Thanks! It came out well didn’t it! This is absolutely stunning! I sometimes don’t like mixing fruit with chocolate but for something this pretty I’d definitely give it a go. I love how simple this is to make but it’s a real showstopper! 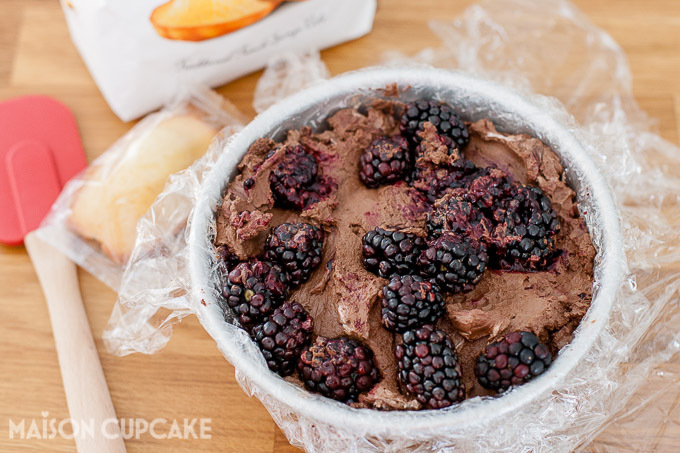 Blackberry and dark chocolate are robust enough to sit together without fighting. I love it! This is so unique and so beautiful! It looks very impressive. I’ve never made a Charlotte dessert before but this has made me want to have a go – or at least just make that quark mousse to serve with some berries. 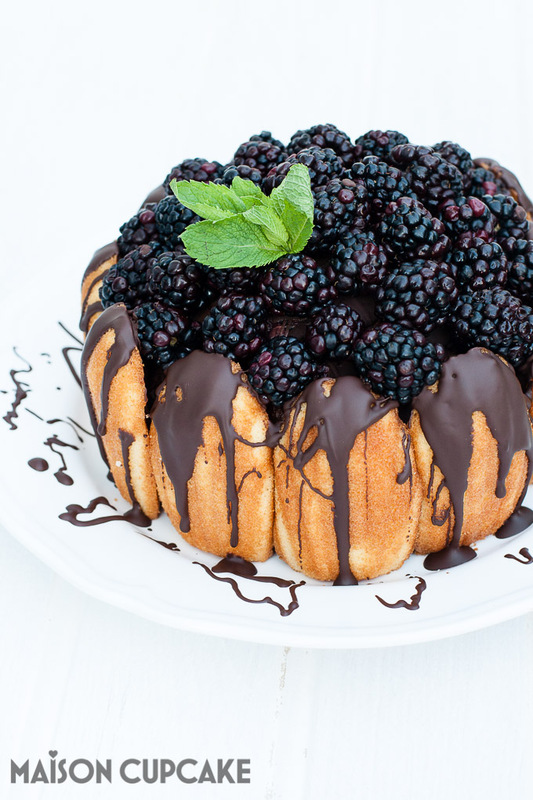 Love the addition of the blackberries. They really balance the chocolate well. Thanks – I must try other things with these two together because you are right they work so well. I’m sending Ted to school with them on Monday! Just the job for a packed lunch! Wow – what a stunner! And so simple too. 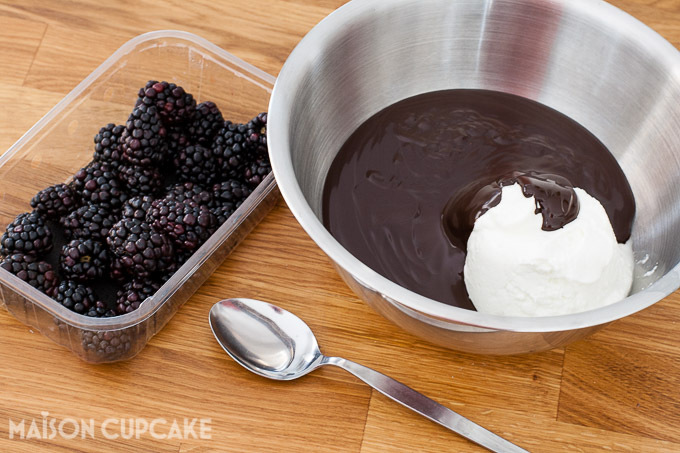 Wouldn’t necessarily have thought of the blackberry/chocolate combination but looks delicious – must give it a go sometime! Yes you must – it’s a dream combo! Wow are you creative. I am in awe of this dessert and how easy you make it look to create it. Great job!! Sarah, my goodness! This looks so good! 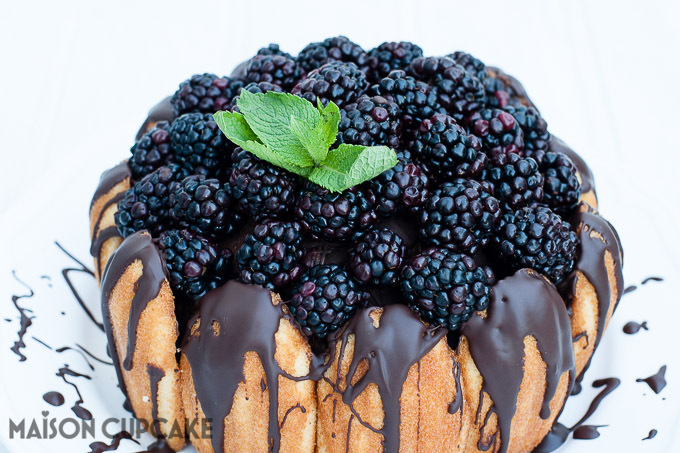 Perfect use of blackberries. Pinning to try soon. Thanks Suzy, I hope you enjoy it! That looks fantastic! What a clever idea. However at the first unveiling it does slightly resemble a brain. Sorry, I can’t unsee it now its in my head. A tasty brain though! How creative! I never would have thought to use madeleines like that before. YUM! Hello – welcome to Yum Goggle! We are now following you on all available social media and hope you will do the same. 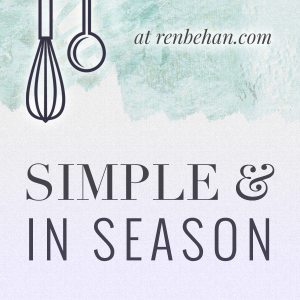 I am so happy this is your very first submission – our readers LOVE half-way homemade recipes and actively search them out on our site. If you didn’t see that category, I will add it before I approve. My daughter Holli and I are the new owners, of about 4 months, and will be promoting your submission on many of the 12 social media platforms available to us. Thank you for your trust and while we are small currently, we are enthusiastic and blogger friendly! This looks so beautiful! We have a massive blackberry bush in the field behind our house – more blackberries than I know what to do with! Bookmarking this lovely dessert so I can make it when they are ripe. This looks amazing! I thought you’d used madeleines from the picture, pleased to see that I was right. This is ingenious, I’m so impressed. I couldn’t believe I missed this and then I realised I hadn’t signed up to your blog. Well that’s been rectified now!